When playing football manager 2015, it is possible to download tactics that other people have created. This can be very helpful if you are struggling to create your own tactic. My personal opinion is that you should create a tactic that will suit the players you have at your club, so if you have a strong target man as your best rated player, then there will not be much point in using him as a poacher. 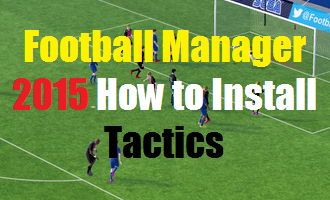 The video below will discuss how to install a tactic on football manager 2015.